Proper planning is the most important step in a kitchen makeover. 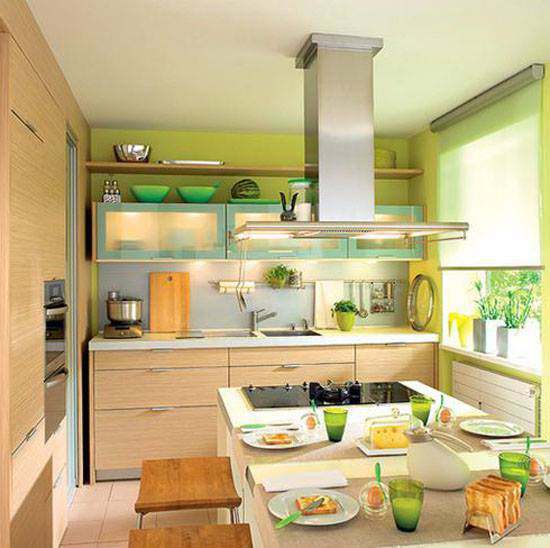 Thinking about how your family uses the space is absolutely necessary for a successful kitchen makeover. The most successful room makeovers incorporate style with function and create a space for every need. Whether you want a complete gut and rebuild or just a few minor modifications, planning your kitchen makeover can help you determine where your budget can make the biggest impact. 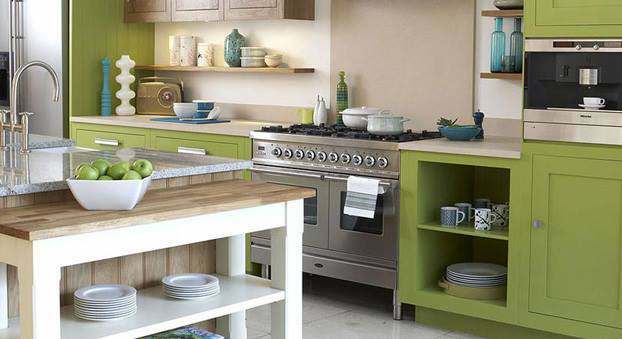 We’ve gathered more than 30 great kitchen makeover ideas and storage solutions that incorporate functionality and style into your home. Just click on the arrows, use your touch-enabled tablet, or press your keyboard’s arrow buttons to go forward and backward. A light kitchen can make a space feel larger. White allows natural light to bounce around and a sunny room is a welcoming room. Using white or cream along with an accent color, such as a rich wood or light purple, can work wonders to create a welcoming focal point. Understanding how your family uses the kitchen and dining room can help you create a space that is better for everyone. 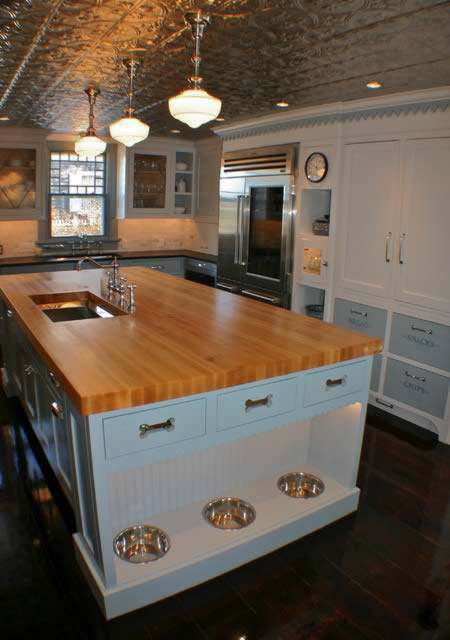 This beautiful kitchen has storage and a dining space for the pets of the house. Remember to think about all the members of the family! 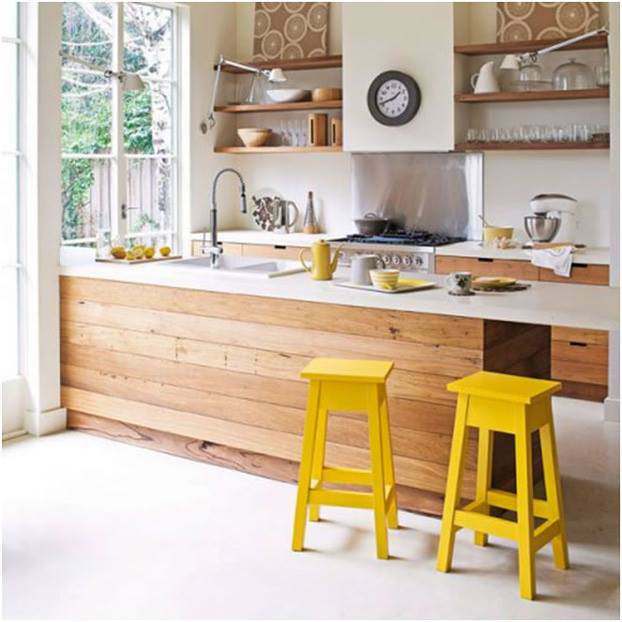 This small kitchen uses rich wood and bright yellow to give the off-white room a touch of glamour. 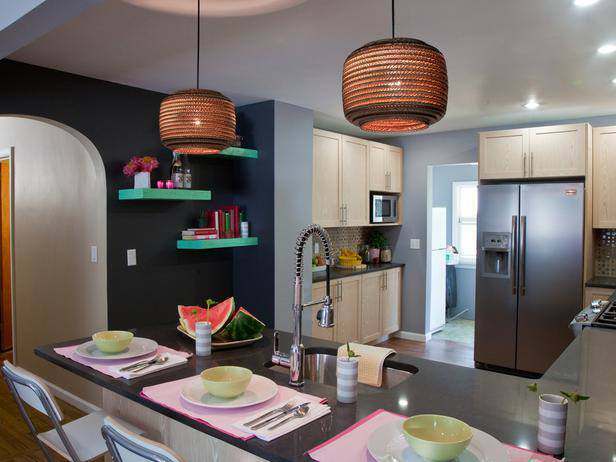 A pop of color can update any space! 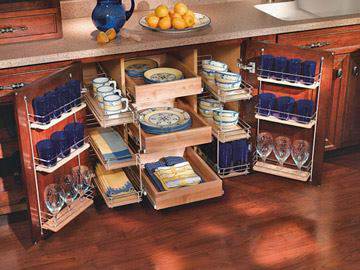 A kitchen doesn’t have to have lots of space to be functional as long as it is organized well. 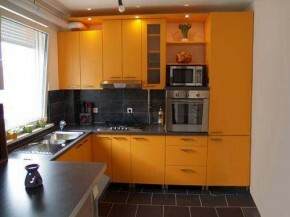 This kitchen is compact but highly functional with the right design. 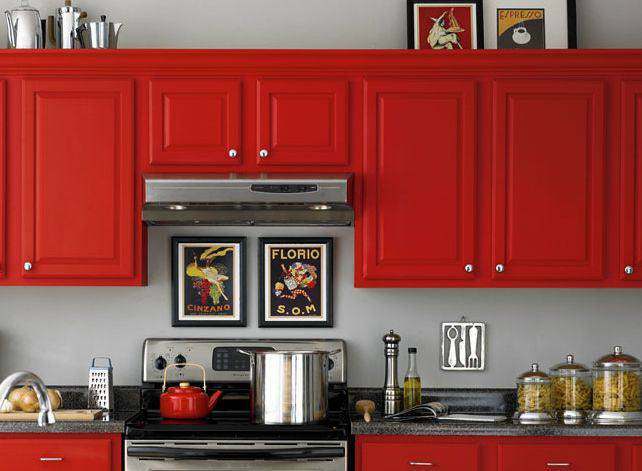 The pop of red is perfect for a kitchen – red is known to increase appetite and is used extensively in restaurants. This kitchen is perfect for a single wide or double wide! Lots of great storage and a smart layout creates a modern, functional space. The stove top and dining table combination is a great way to make a small space work doubletime for you. This kitchen is the epitome of modern design. Subway tile, white cabinets, and stainless steel is all the rage in modern kitchen design and for good reason – it’s a smart combination of functionality. Painting your cabinets can completely change the entire look of your kitchen. Combining darker colors with lighter hues creates a rich space. This kitchen began with a basic design, cream cabinets with a dark counter top, but painting the smaller corner wall a deep charcoal grey gave it a whole new dimension. Don’t be scared to try new things! 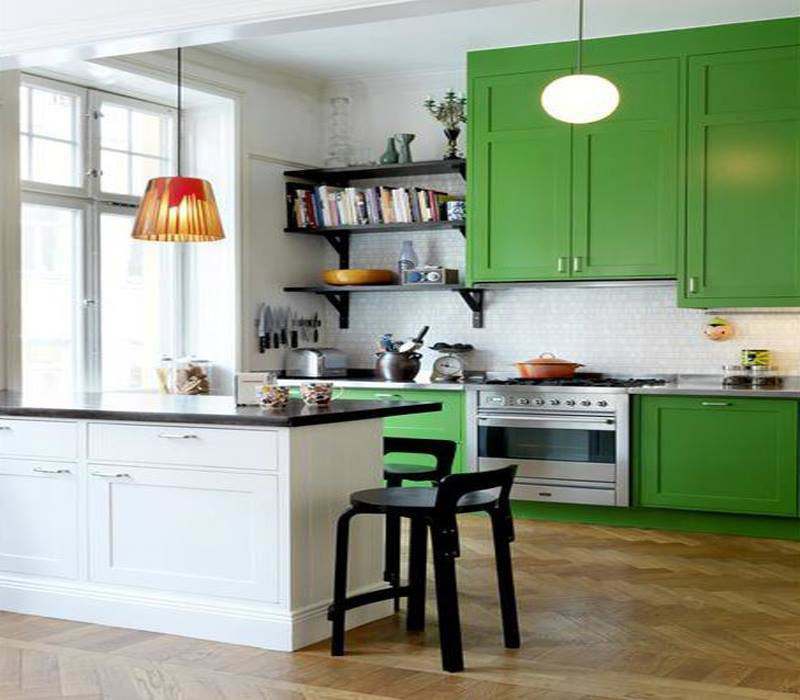 Here’s another great kitchen that uses color perfectly. 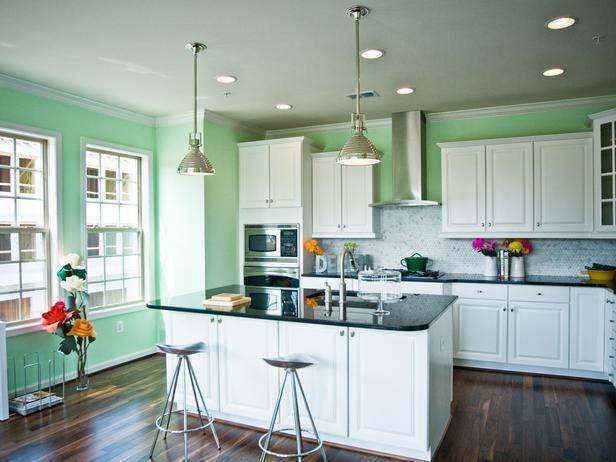 Notice the cabinets are a bright green but the island remains a neutral white – this is a great way to separate the space. Open floor plans are popular and convenient but it’s hard to give each area it’s own look. Using an island adds function but also allows the space to be divided. Creating a design board or mood board before you begin your kitchen makeover will help you match up different textures and colors. This kitchen is a great example of pulling several different materials together to create a rich, visually appealing space. 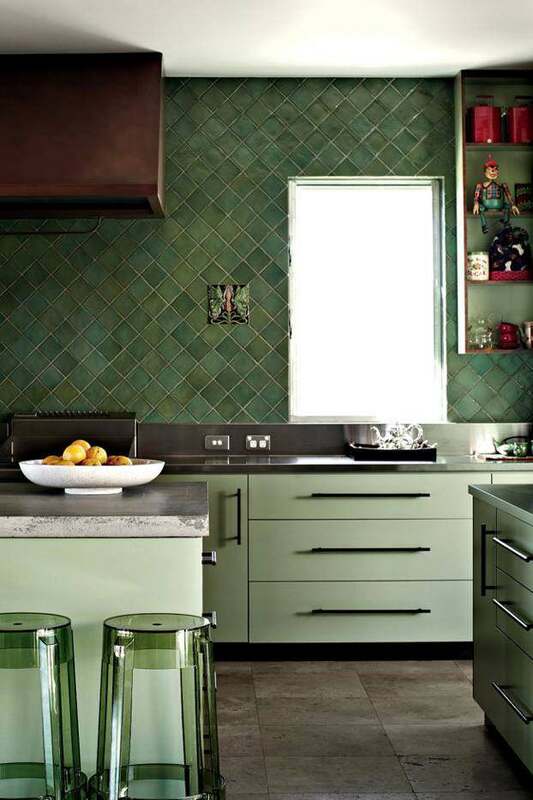 The beautiful tiled back splash pulls the space together wonderfully and sets the stage for the entire room to shine. 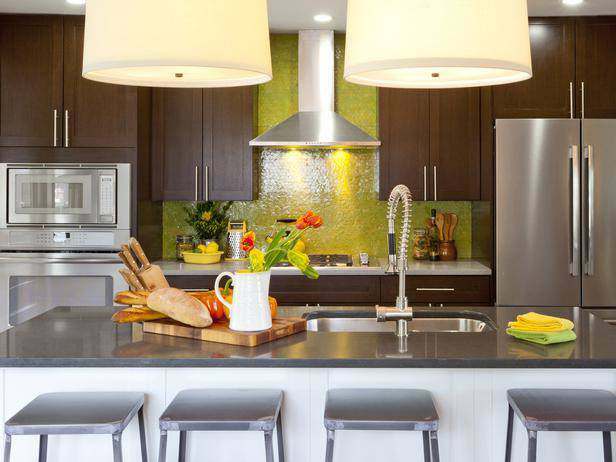 Learn how to create a beautiful back splash with paint. White cabinets with black counter tops sitting on a dark floor is one of the most popular looks in modern kitchen design. It’s a functional, easy to clean design that can be updated with ease. Painting the surrounding walls a new color will instantly update the entire room! This design uses dark hues and lots of texture to create a delightful space. 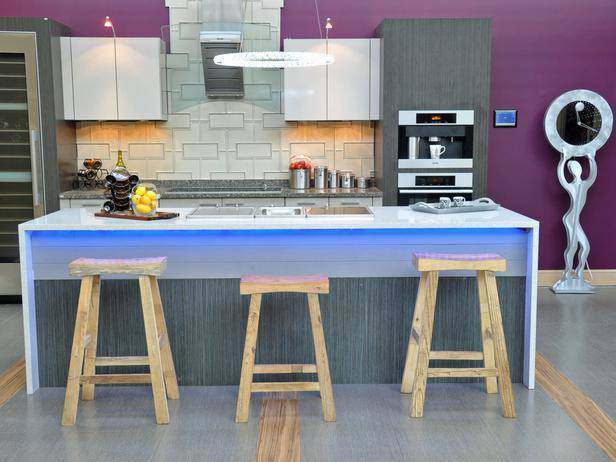 Modern materials are mixed throughout and deep purple is used as an enticing backdrop. 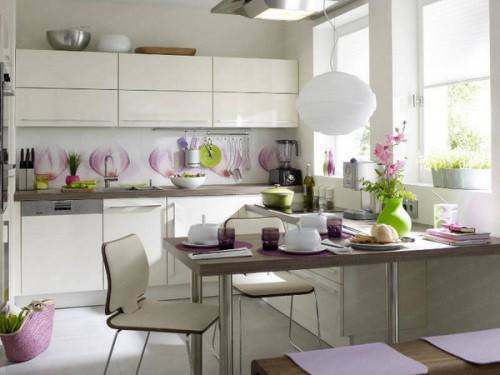 This kitchen mixes 2 popular styles perfectly! 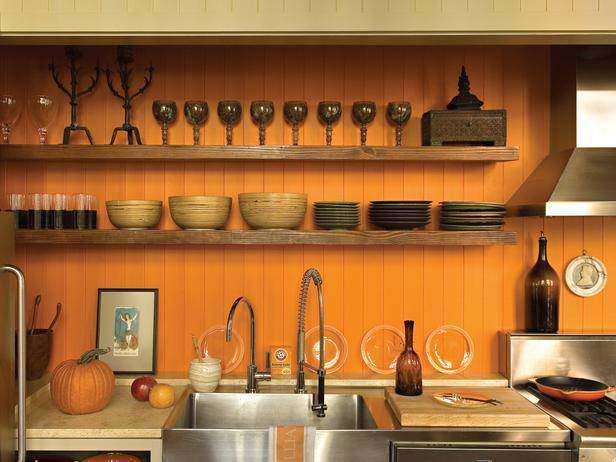 The back splash is made with a simple bead-board painted in a deep orange paired with natural wood shelving to create a country – primitive decor. But the stainless steel appliances creates a modern dimension. This kitchen uses sections or ‘cubby holes’ to house sections of the kitchen, opening up much-needed floor space. If your manufactured much-needed, you could build a small addition to house your stove, sink, or refrigerator. You would be able to add lots of space without spending lots of money! This is a great kitchen makeover inspiration for anyone that loves color! 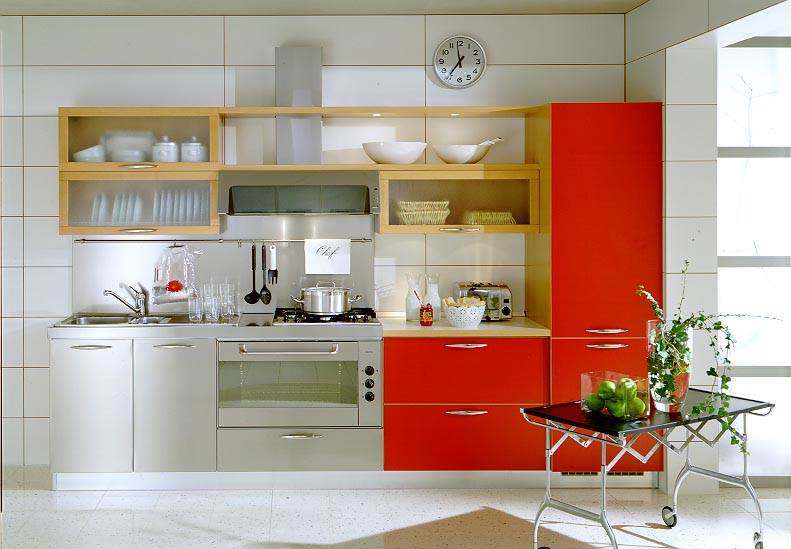 The cabinetry is great example of using color to your advantage. Using black along the floor with one tall cabinet gives the eye something to focus on, making the space seem taller and larger. The white upper cabinets blend into the background, creating lots of storage without being too obvious. This kitchen makeover is loaded with warm, rich color. Contemporary doesn’t have to mean cold and uninviting, with the right colors you can have a sleek and friendly space that functions well and is super easy to clean. Dark cabinetry is a popular choice for kitchen makeovers because they don’t show dirt and grim and can be used in any style. This kitchen couples traditional wood with a tiled back splash that shines. The white island is used to separate the kitchen from the dining area and allows each space to have its own style. 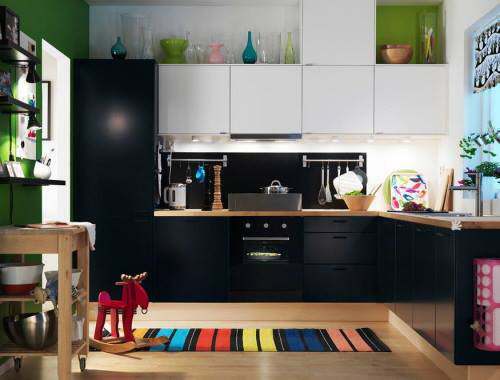 A small kitchen has endless possibilities! 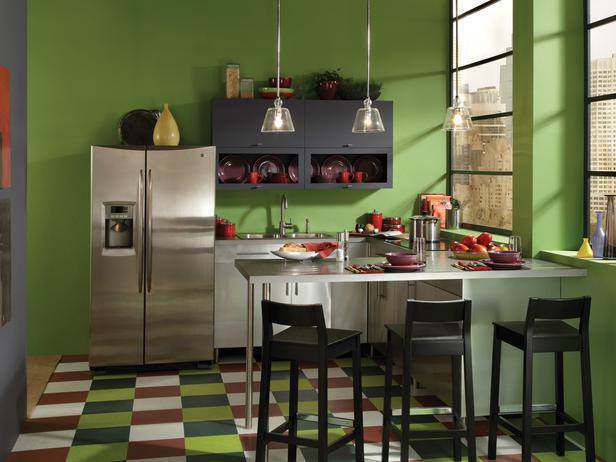 Using lots of color can help a small space be more visually appealing, like this colorful checkerboard floor. This small kitchen makeover has everything you need but isn’t using the standard triangle of function that we’ve all read about regarding smart kitchen design. You don’t need a triangle – you only need the space to function for you and your family, no one else. 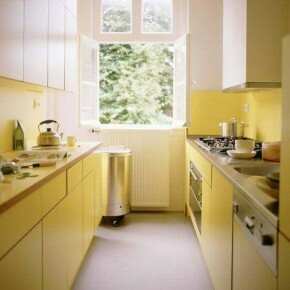 Great Galley, That’s a Nice a Kitchen! Galley kitchens are perfect for single wide manufactured homes. Lots of storage in a soft butter yellow color makes this a highly functional, beautiful space without taking up too much square footage. This kitchen makeover features lots of modern day kitchen decor such as open shelving, stainless steel appliances, natural wood, light counter tops, and colorful cabinetry. 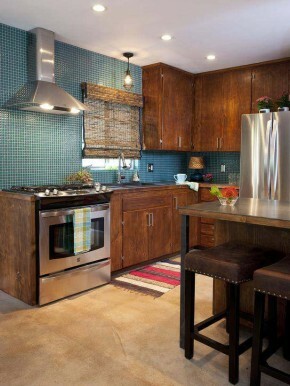 Mixing several materials is a great way to add visual appeal to your kitchen. 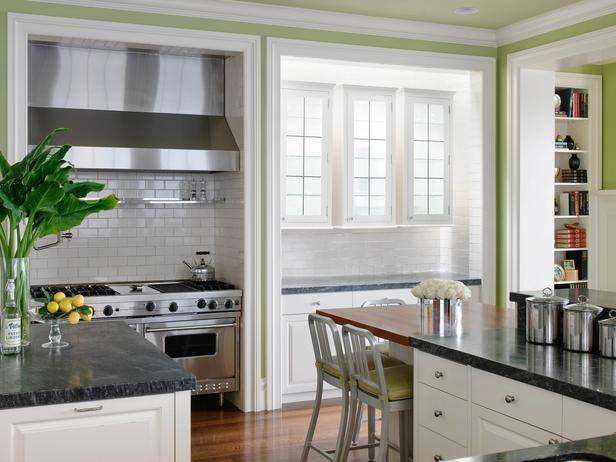 Love the look of a traditional kitchen but enjoy modern design elements too? This is the kitchen makeover for you! By simply installing a tile back splash from counter to ceiling and new appliances you can instantly update a traditional kitchen. Metal cabinets are coming back in style because they have a tremendous lifespan and are super easy to clean. Oftentimes you can find a used set at a great price on Craigslist or Ebay. With floor to ceiling cabinetry, you can fit lots of storage and function into a small space. 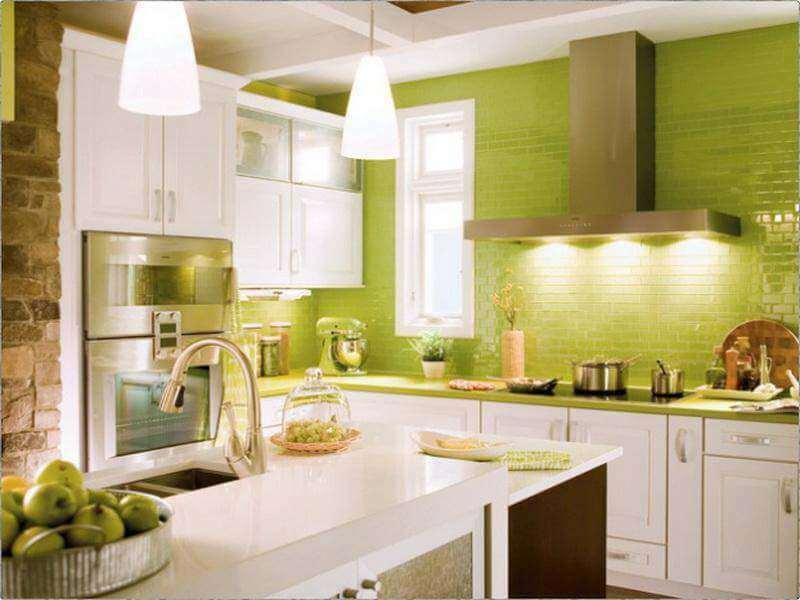 Using a high impact color on that floor to ceiling cabinet installation can act like an accent wall for your kitchen. Still need kitchen remodeling inspiration? This Mobile Home Kitchen Renovation will Make you Jealous! Remember, you don’t have to completely gut the space for a smart kitchen makeover. 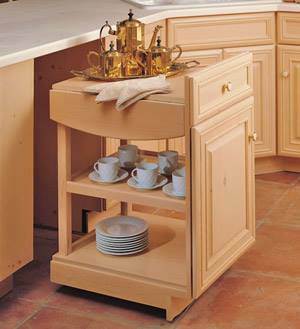 Installing additional storage and finding smart solutions to minor issues can do wonders for your kitchen. One of my family’s biggest complaints is our spoon drawer – it’s always a mess and finding what we need is a hassle. 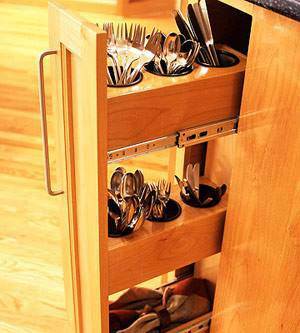 This slide-out utensil cabinet would be a perfect solution to our problem! Bakers need a lot of stuff to make their delicious treats. These staggered step storage drawers are a great way to drastically increase functionality in a cabinet or pantry and put everything you need to bake that cake in one area. 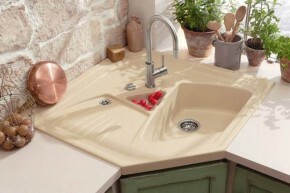 A corner sink can add lots space and functionality to your kitchen. Corners are usually reserved for small appliances but by installing the sink you can increase both your cabinet space and your counter space. 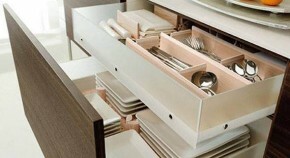 Here’s another take on utensil storage, this one using a single drawer. 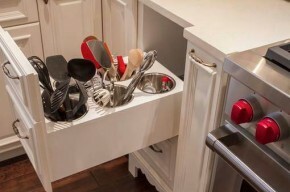 What a great way to ake that messy spoon drawer disappear! 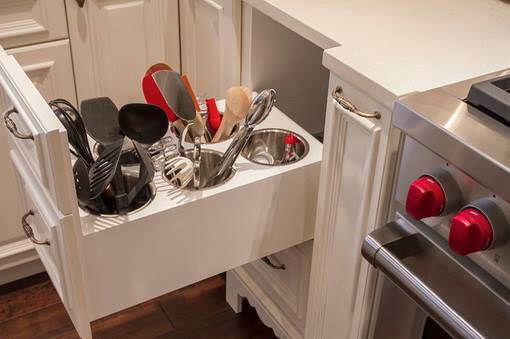 This is a great solution to those messy bottom cabinets that most of us have. With these layered slide-out drawers you can organize like a pro – there’s a place for everything! 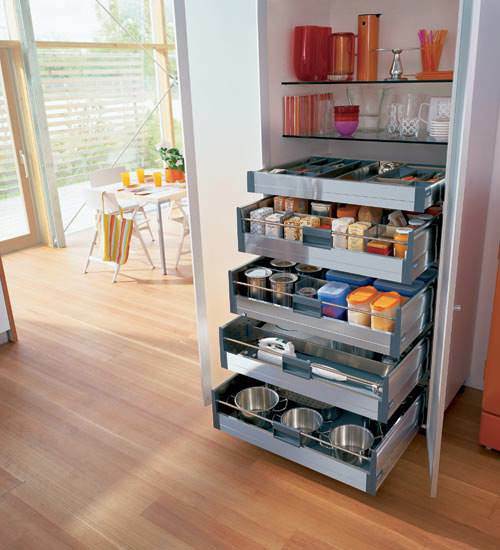 This storage solution utilizes every inch of space in a typical double door cabinet. By using a setup like this you could effectively reduce the number of cabinets you need by a lot. There’s 4 cabinets worth of dishes in one spot! This small serving cart on wheels can be stashed away when not in use. You can use this little cart for more than just a serving tray too – the possibilities and sizes are endless. 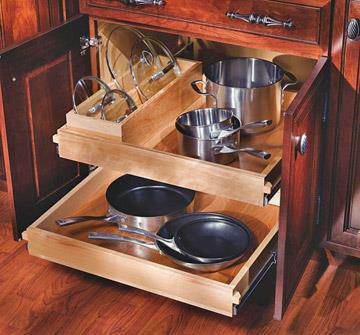 Installing pull-out drawers in your cabinets is a very popular trend, as it should be. You increase your storage space significantly and at an affordable price. You can buy wire inserts similar to the one in the photo for less than $1000 it’s a great way to store your pots and pans. Remember, if it can be done in a site-built home, it can be done in a manufactured home. There’s very little difference, if any at all, in the measurements and materials between a factory-built home and a site-built home. You can easily use standard materials like sinks, cabinets, counter tops, and appliances from Lowe’s or Home Depot in your manufactured home with little modification needed. All images were found on Design T’s Facebook Page. Just one thing, corner sinks are the worst idea if you wash the dishes by hand. I have one and my back hurts every time. You have to work in a really bad position and don’t have space for your feet. Thanks for the input Lucia! I never thought about that. Where can I find the hardware pictured in smart storage solution #6 ultimate organization? Particularly the wire pull outs and door trays. It’s all breathtakingly gorgeous! What fun to have such a beautiful new space to work in! 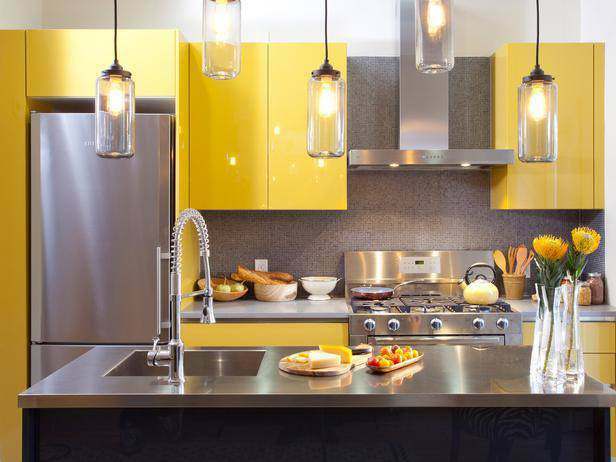 This is such a great collection of kitchen ideas. Thanks for compiling them together. Hard to pick which one is my favorite! 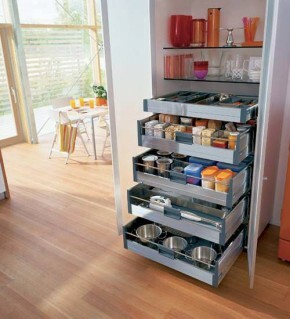 How can I purchase the Smart Storage Solution #1: Slide-out Utensil Cabinet? I love it! Those are awesome! They are a bit pricey though – you may be able to have a local woodworker build you one a lot cheaper or use the components from Home Depot and Ikea to create a similar version. Thanks so much for reading MMHL! Good luck! My husband and i just purchased a 2005 Palm Harbor. It is going to be our retirement home and it is divine! We do need to make some cosmetic changes in the master bath and reading MHL will give us the inspiration and guidance we need. Thank you for MHL!! Congratulations on your new home Patt! I bet your home is gonna be gorgeous! Just wanted to say that I LOVE LOVE LOVE your website. THANK YOU! Thank you so much! I appreciate it and am so glad you like it! 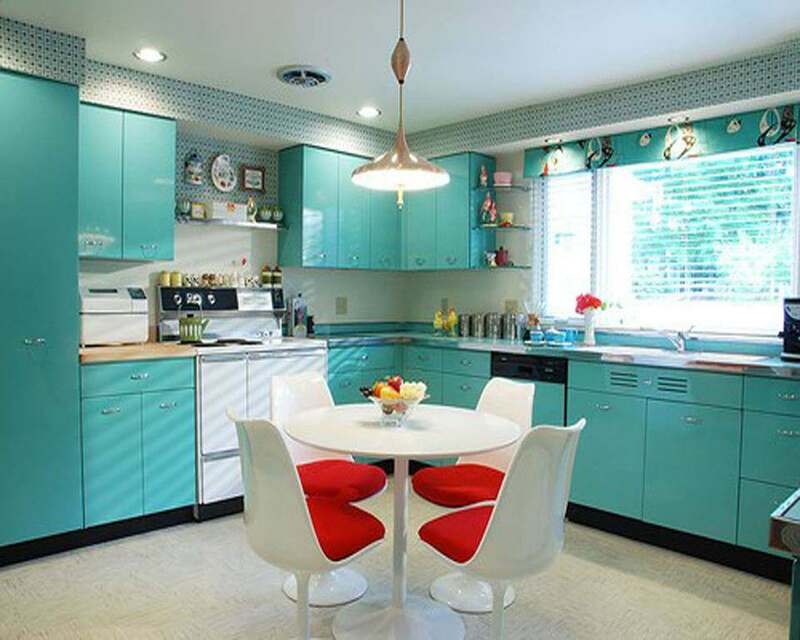 These are some awesome looking kitchens. I like the ones that have the painted cabinets. For some reason, I really like the red cabinets. This is an amazing site mobile home site. Thanks Alex! I’m so glad you like it! I hope to expand it and make it the most useful and best resource for mobile homeowners. Thanks for reading and for taking the time to comment! I appreciate you!